After a hiatus, the Coffee People series is back. In previous installments (here, here and here), we discussed coffee + design, coffee + culture, and coffee + ultra running/mountaineering. Today, enter the realm of coffee + music, with the one and only Joe Kwon. Joe: resident cellist of the band The Avett Brothers, Haiku drafter, photographer, cook, eater. Coffee drinker. One cool, kind person. Here’s one of my favorite from the band – February Seven. Many thanks to Joe for taking the time to do this. Enjoy. INL: The world famous Avett Brothers are habitually on tour, baptizing crowds with memorable sets. You are asked endlessly about your music, but I want to know how coffee fuels those sets – “coffee on tour.” What are some coffee habits of your fellow band members? Any notable coffee routines? Joe: I proudly introduced these guys to Counter Culture coffee a few years back after I struck up a great relationship with them. They actually gave me 3 days of training to brew pour over coffee and even set us up with a bus pour over set. So, since then, we have been making pour over coffee on the bus from the moment the first person wakes up till about 5pm. I drink significantly more coffee on the road than I do at home. 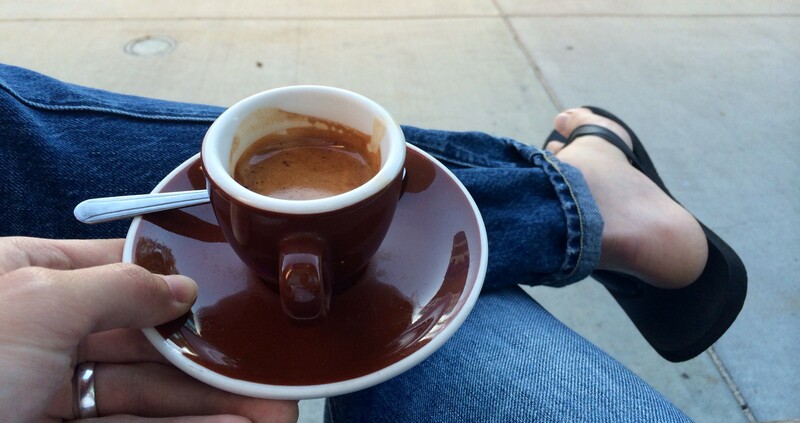 INL: Among the dozens of cities you’ve toured through, do any good coffee shops come to mind? Joe: So many, but it’s funny I don’t recall the names of them. I just know how to walk to them from the venues that we play. Sometimes I’ll make a special trip, but most of the time I drink my coffee on the bus. What were some of the better coffee cities? I’d say every city at this point has a great coffee shop. It just takes some research to find the ones that fit your mood and aesthetic. INL: What are your favorite brewing methods and coffees? Joe: I’m a 100% pour over guy. I own several methods, but my favorite, tried and true method is the bonmac pro-cone with white paper filters. INL: In early 2014, the Avett Brothers collaborated with Counter Culture Coffee to benefit St. Jude’s Children’s Research Center? How did that collaboration come to fruition? Joe: Ethan Fogleman from Counter Culture Coffee actually reached out to me via social media to invite me to come tour their facility. I was living in Durham at the time, and little did I know they were roasting some of the worlds greatest coffee just 5 minutes away. INL: You were not always the energizing cellist of the Avett Brothers – you started young, but as a classical musician. What prompted the switch to folk rock? What was challenging about that musical transition? Joe: Before I joined the Avett Brothers I was actually working for IBM and I felt the pull from that life to come back to music. I always wanted to be a cellist ever since my first cello lesson, but never did I imagine it would be in this capacity. I’d say one of the most challenging things was that I had very little popular music knowledge. I’d never listened to anyone outside the classical greats. I could name symphony orchestras with great brass sections before I could name a member of Nirvana. Needless to say there was a lot of room for music education. INL: Before joining the band, you graduated from UNC with a degree in computer something and worked for IBM. What nudged you to shift back to music? What were your fears when you u-turned away from Corporate America and onto the stage? What were your joys? Joe: My fears were that I was going to lose my house and everything else, but it honestly didn’t feel too daunting. I had come to terms with it. I guess that’s what it took, to not care about the money or stardom, but just to truly love performing and being on stage. INL: What does music add to your coffee experience? Flipping that around, what does coffee add to your music? Joe: I actually drink my coffee at home in complete silence. It’s my way of truly engaging with my coffee. It becomes a ritual. Coffee fuels my life on the road as a way to stay awake at times. In other words, home life and tour life mean different things to my coffee habit. INL: Your website, tasteontour.com, is a pictorial memoir of the day-to-days of the tour. Two things come to mind: why film, and why black-and-white? Joe: Film because I love the delayed gratification, and film seems for finite. It does get a bit difficult to grab shots though, but that’s the beauty of it too. INL: Master cellist, knowing photographer, and more-than-amateur cook. You do it all, but now you are also chipping away at wood. What inspired you to begin woodworking? Any proud pieces yet? Joe: I’m actually working on my biggest piece yet, it’s a dining table for my house. I got into wood working after I had discovered a significant amount of water damage in my house and I helped a buddy of mine reconstruct it. I had amassed a bunch of tools and felt it would be a waste to just sell them, so I started making things. It started with cutting boards, then benches, then coffee tables, etc. INL: Final question: what is coffee to you? Joe: As I mentioned above coffee is the thing I look forward to you when I go to sleep at night. I love the moments that I have and share over a cup of coffee. I love sharing a great cup of coffee and the experience behind it. Delayed start to the day, thanks to Jonas. The snow on the sidewalk has resided, but in its place another crunchiness, the salt, which is not as inviting. There are few places where I feel comfortable ordering the “coffee-of-the-day”, but Swing’s is one of them. Listened, from start to finish, the Bach Renovation album by Yoonseung Cho. Read that Mark Zuckerberg’s personal project this year is to write an AI program for his home. Some write code, some write literature, some write music; shame that one form is lucrative than others, when that form is artificial at best, while others are genuine. Zuck says AI is good at recognizing patterns but bad at common sense. Books and music are all bundles of common sense, art forms in which our common sense is jumbled, rearranged, and reestablished in a variety of ways. Less is more. Design is most effective when it whispers. Shouting, while eye-grabbing for fleeting moments, is distracting to the ultimate experience of enjoying a tasty cup of coffee. 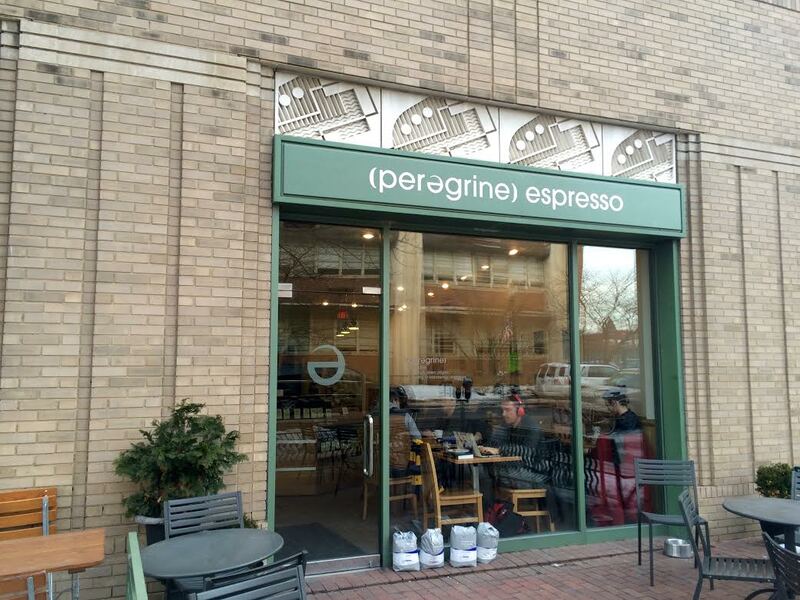 Peregrine Espresso, in the Eastern Market neighborhood in DC, embodies this ideal. I have heard of Peregrine’s impressive selection of impeccably (in-house) roasted beans, and the masterful orchestration of its baristas. All true. The natural sun-dried Yirgacheffe I tried that day, from the Idido farm, was immaculate. With hints of Concord grape and strawberry jam, the cup was balanced with just enough acidity. 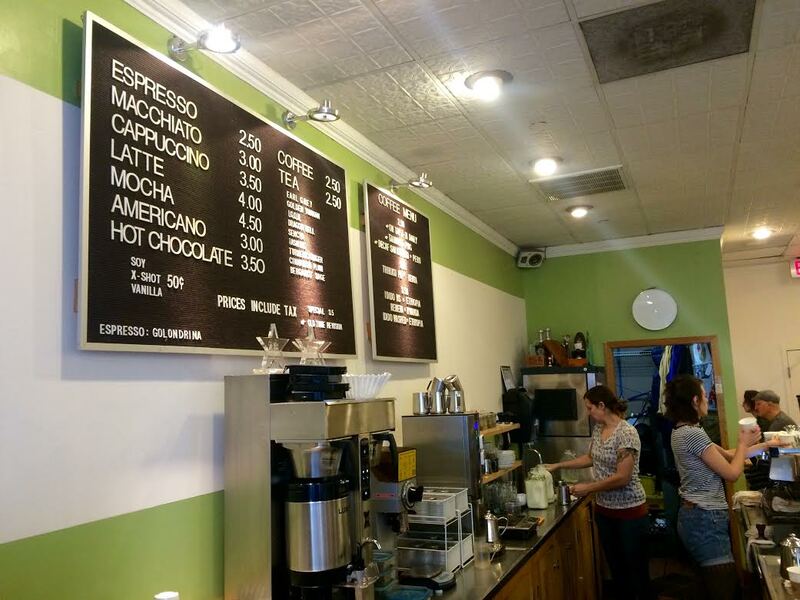 Compared to the flashy flavors of its coffees, the cafe itself is very understated. No Scandinavian furniture, no fancy lighting, no multi-colored chalk drawings sprawled about. Space is a premium. 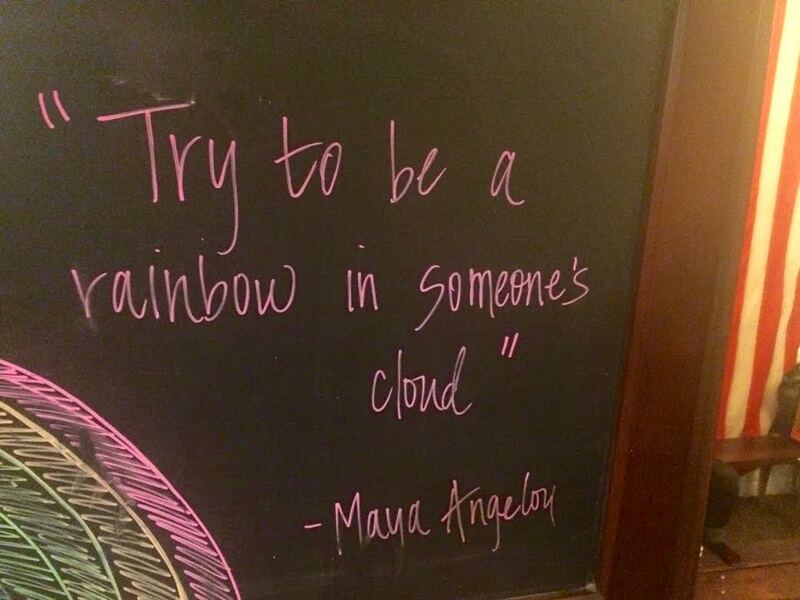 Yet the cafe is profound. 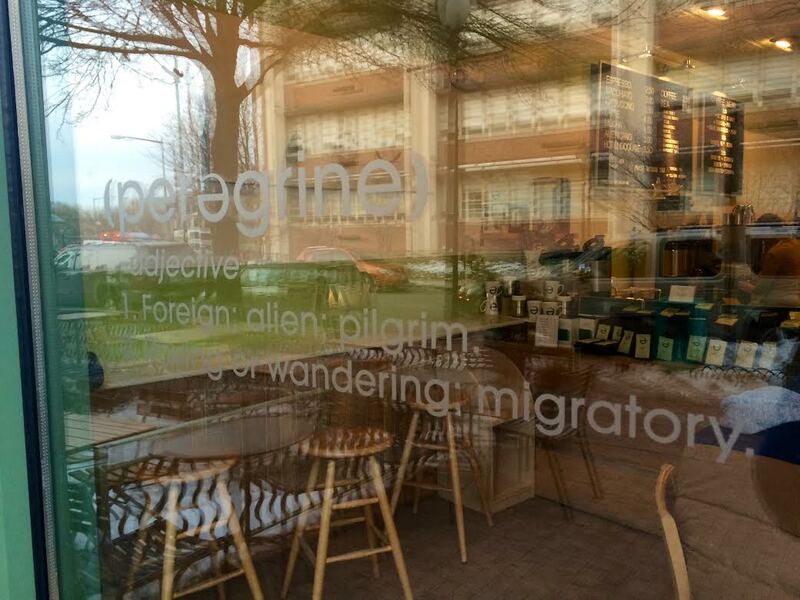 Peregrine’s logo, re-created on one wall, is symbolized with a shade of the color green; that green theme is subconsciously reminded throughout the cafe, to the point where it goes unnoticed until the second or third glance. The place does not shout “hipster.” It is clean-cut, minimal, where you have just the essentials – bar, brewing gear, pastry/coffee display, tables, chairs. Not much else. On a rather unassuming Wednesday afternoon, the cafe was bustling. Patrons order, chat, drink, chat some more. Some stay, some leave. A cafe carrying out its essential functions is a beautiful thing. Serve great coffee, provide an inviting space, highlight your brand quietly in design, but powerfully in taste. Specialty coffee, in recent years, has attracted (unwillingly, and unintentionally, maybe) a pretentious side. 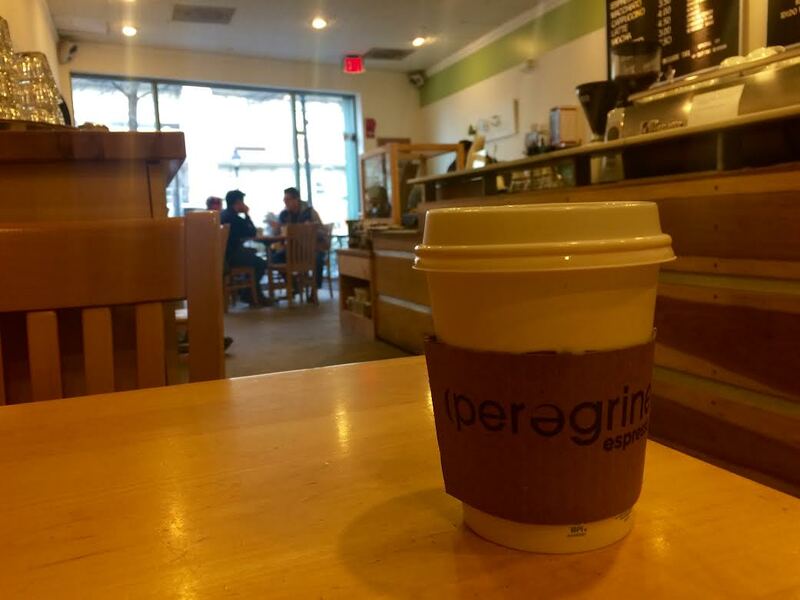 While in line at Peregrine, I overheard an interesting exchange between a patron and a barista. Perfectly legitimate request, until you think it through. The AeroPress and Bialetti are both excellence brewing contraptions. But getting freshly roasted specialty coffee pre-grinded – by the bag – defeats the purpose of buying specialty coffee or brewing with varying devices. Brewing devices exist to highlight different angles and flavor profiles in a batch of coffee. The lone fact that you are brewing using an AeroPress or Bialetti has little value in itself. It almost seems as if saying “I brew with an AeroPress” automatically places one in the class of coffee connoisseur. It does not. It does not take a major stretch in imagination to think that coffee – although perfectly sourced, processed, and roasted – that was ground three, five, seven days prior, is not the same coffee. It loses aroma and essential oils that are so vital to highlighting the coffee’s flavors. The AeroPress and Bialetti are not flavor injectors; they are mere tools to enhance what the beans already possess. There is no room for pretentiousness in coffee. While the science behind cultivating, picking, processing, roasting, and brewing coffee is undeniable, enjoying coffee is simple, as simple as things get. In this regard, coffee’s magnetic attraction to design is irreversible. Contraptions, cafes, brands – they are there but not there. Getting out of the way for the coffee in the cup to shine is hard to execute but essential to sustainable success. Peregrine would have Rams’ approval. Aesthetic beauty is best exemplified through unobtrusive, honest design. And design is best exemplified when there is as little design as possible. A feeling of loss? Theft, maybe. Relinquishment? It’s the feeling when a best kept secret is no longer a best kept secret, when the world knows what you thought was secretly yours. I guess it was never a best kept secret in the first place – it was never ours, never mine. It was the world’s to begin with. 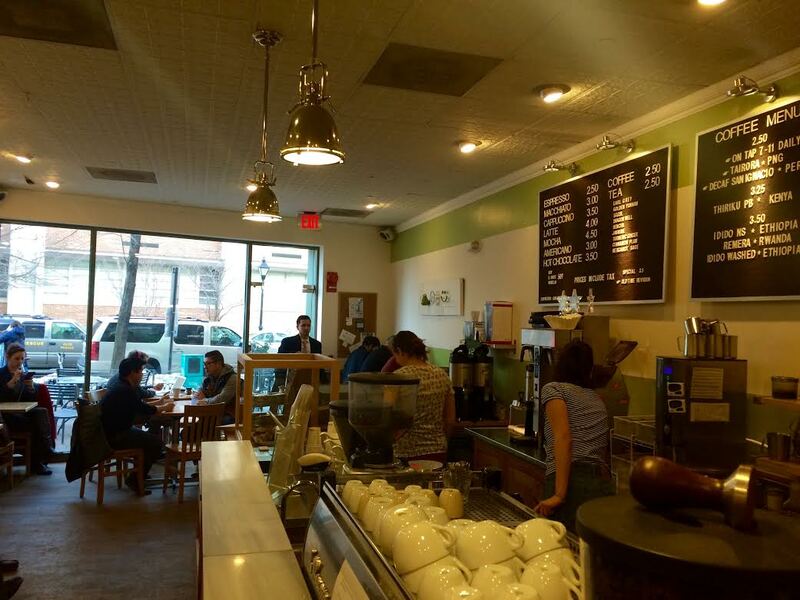 I’m talking about Baked & Wired in Georgetown. Weekday mornings, weekend evenings, it seems nearly impossible now to find a decently serene time of day to fully enjoy this beautiful coffee shop. 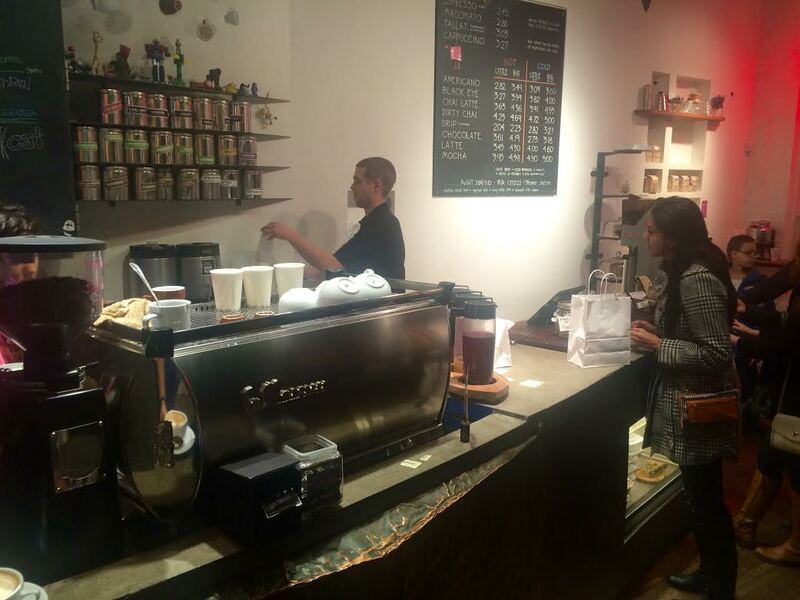 The coffee bar is on full throttle – milk steaming, espresso flowing, coffee grinding. Tourists, passers-by, serious folk, casual folk, they’re all lined up in a squiggly formation in front of the pastry and cupcake shrine. And macaroons, too. Coffee is great here, partly because they usually offer a variety of single-origin beans from a few roasters. Intelligentsia, Stumptown, and so on. I don’t usually drink lattes, but when I do, it is here at B&W. If you do have a sugary urge, do grab a cupcake. Yes, you read that correctly. Cupcake. There is a particularly famous joint in Georgetown, one that has its own TV series, where tourists stand in lines that go for blocks, in rain and snow. You might of heard of it, yeah, Georgetown Cupcake, or whatever. Totally overrated compared to the stuff at B&W. Better frosting, better flavor, better and better. I don’t usually buy cupcakes, but when I do, you get the gist. 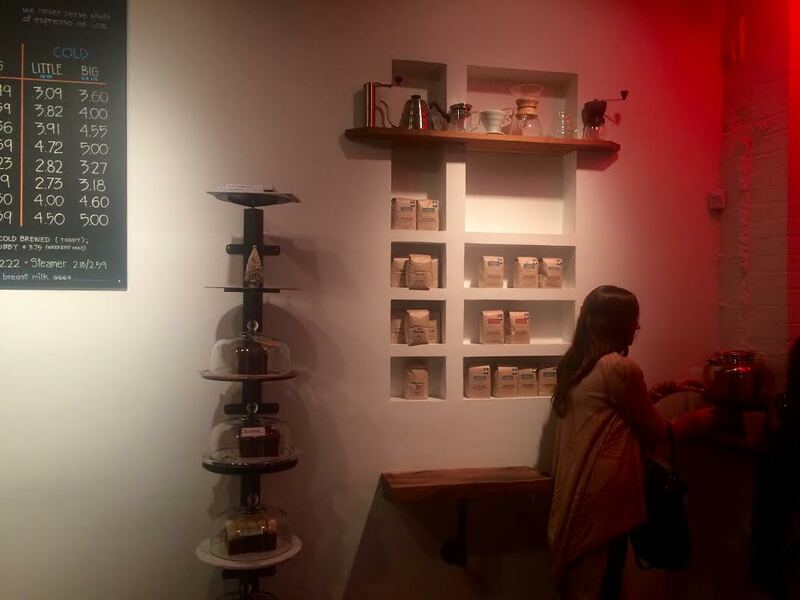 Great coffee, great baked goods. But I like this place because of its somewhat odd, unbalanced interior. The coffee bar is understated, the La Marzocco machine is prominently featured, while random trinkets hang from the ceiling in harmony with hand-written menus. Minimal, essential. The baked goods bar is contrasted by giant moon-like lighting fixtures, illuminating the assortment of carbohydrates enveloped under glass lids. More like an art showcase than a pastry display. Glamorous, even. 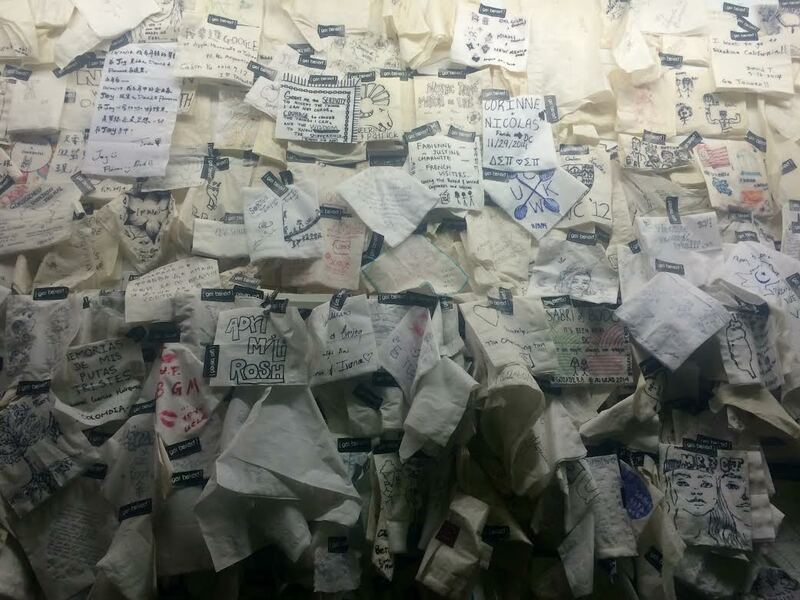 The back of the coffee shop is starkly different, highlighted by a “Napkin Wall.” Dozens of paper napkins are taped to the wall, all of them with some form of writing or drawing (or both) on them. 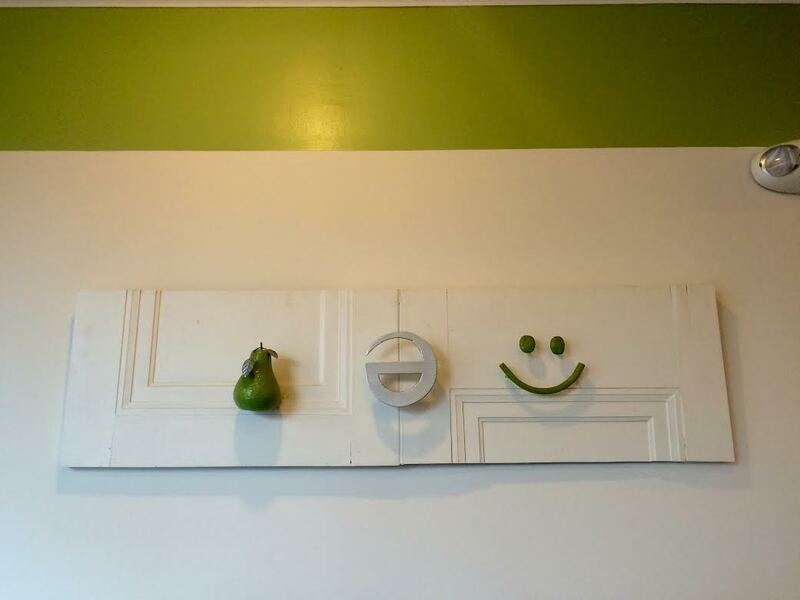 I don’t know what the wall is supposed to represent. 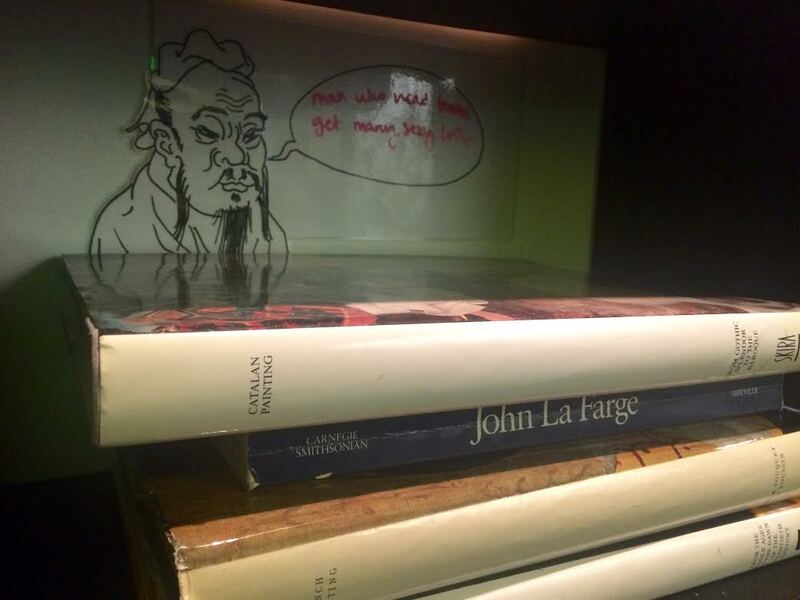 As a collective, it seems to be a “I was here” sort of thing, individual doodles making a broader collage with no particular meaning. Meaning, however, is no prerequisite to general aesthetic beauty. And the wall, in an eery way, is beautiful. The coffee shop that was never mine, never ours, is no longer mine, no longer ours. But it’s still there, serving good stuff, and the wall is growing. 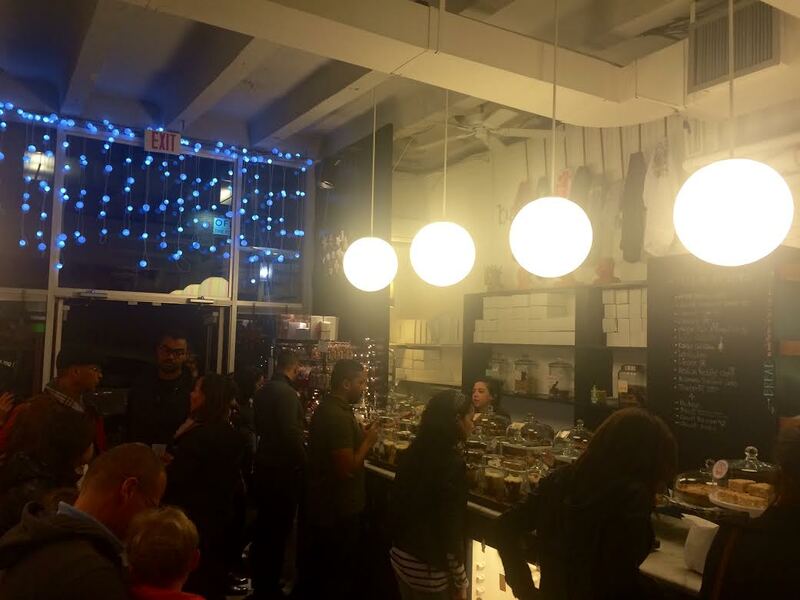 Each stroll through Georgetown will always feel incomplete without a visit to Baked & Wired. A sudden thirty-degree drop in morning temperatures in the the DC area is a not-so-surprising surprise, if the National Weather Service is correct in predicting record snowfall and temperatures this coming winter. As a survivor of the infamous “Snowmageddon” a few years ago (one slab of memory includes trekking through knee-deep snow to get to the nearest Starbucks for WiFi), I am both looking forward to these predictions and not looking forward to them. While I am curious to see whether this winter will match Snowmageddon, I am not sure how I feel about being trapped indoors for seven days. Make pots and pots of stew, I guess. In any event, cold mornings have me thinking about two things. Boiling hot bowl of pho and strong coffee. There are not many establishments where one can get both good savory food and good coffee. Plenty restaurants have good coffee service (I remember the now defunct Adour in the St. Regis hotel in DC serving excellent La Colombe after an exceptional lunch offering), some exceptional, but it is not easy to name a place that I could confidently say that I would dine there for the coffee. Of course, one hunts down coffee shops for good coffee, where good food is also often discovered, but predictably of the sweet variety. Pho shops hit you twice. First with that meaty, oily, minty, cilantro-lime-pepper-Sriracha broth. Next with a shot of slow-dripped black magic with near 50% condensed milk content. Meat-savory closely followed by sweet caffeine, a lethal combination for any cold night. 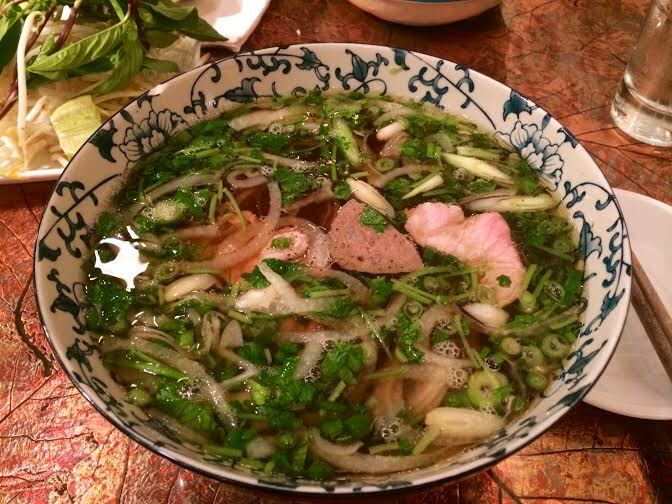 For a good bowl of pho, I usually find myself driving around the outskirts of Vienna, VA, Fairfax, or the more immigrant-dense areas of Falls Church. My experience tells me these places (often run-down joints in hidden streets and alleys) have the best authentic foods, including pho. That partially explains why I have yet to try a decent bowl of pho in the District. 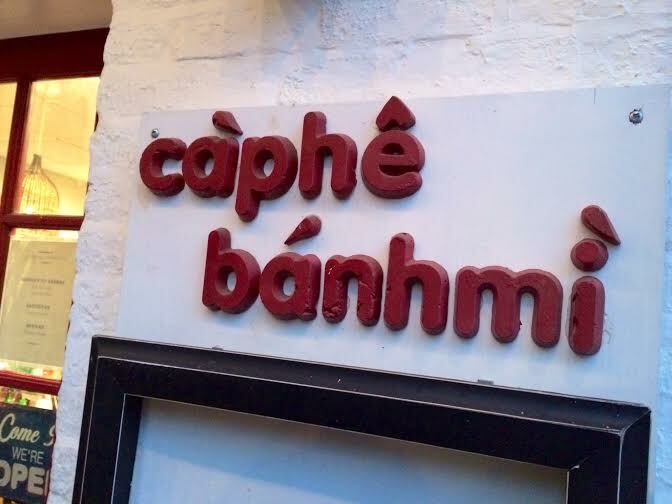 So when I walked into Caphe Banh Mi in Old Town Alexandria, in a more “hip” neighborhood near King Street, I had no expectations. 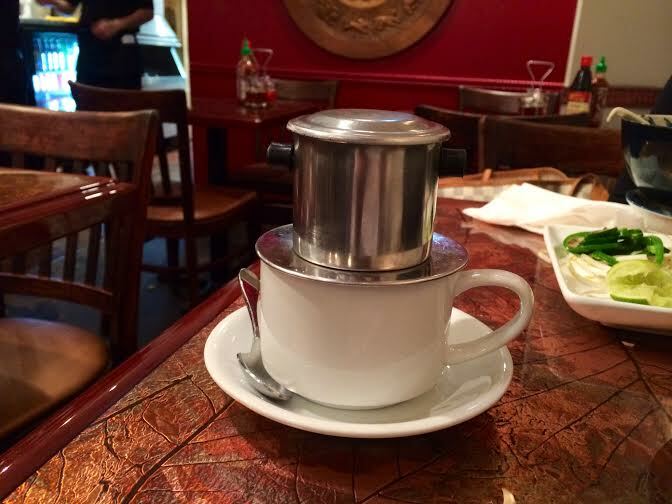 Surprisingly, I was impressed by both pho and coffee. Here’s what Tom Sietsema (a renowned food critic in his own right) of the Washington Post had to say about their pho. “Pho comes with a minimal amount of the shaved beef we request, and its demure broth requires every accompanying enhancer – lime, jalapeno, Thai basil – to inject more spirit into the bowl.” While he is partially correct, I have to disagree with his overall impression of the place. First, in a bowl of pho, the “shaved beef,” called “tai,” is the last thing I look forward to. Rather, the more tasty bites come from the tripe, fatty brisket, meatballs, and tendons. Sietsema, of all people, you should know that. (Oh sorry, maybe I’m mistaking you for Robert Sietsema from Eater NY, a respectable offal and ethnic cuisine master) But he’s right in that the bowl could have used more from the animal. Second, I would not use the word “demure” to describe the broth. I was rather surprised by the depth of the broth; while it was not as deep or flavor-packed as Pho 75 in Falls Church or Viet House in Fairfax, it was rich and clean. And to bash on Sietsema again, part of the pho “spirit” inherently lies in the “accompanying enhancers,” the lime, jalapeno, and Thai basil. You first enjoy the broth as is, and as the meal progresses with each slurp, you drop in the jalapeno and the basil, and of course the bean sprouts, to experience complex layers of texture and flavor. The lime squeeze and Sriracha give you that extra kick on colder days. As I transferred the last few spoonfuls from bowl to mouth, I eyed the stainless steel brewing contraption, as the midnight dark coffee (yes, probably way over roasted by my usual standards) slowly dripped down into the waiting pool of condensed milk. A light swirl with the teaspoon across the bottom of the cup transform the black liquid into a murky brown hue, and in three long sips, I am a happier man. So as I dig through my closet in search of running tights on this frigid morning, my thoughts are swimming across seas of beef broth and sweet coffee. Long live the season. My interview with Tony Krupicka is quickly becoming one of the most-viewed pieces on this site. While most of the reviews and comments have been positive, there were several that raised a legitimate question: why is Tony an “influential coffee person?” Fair enough. This is a good opportunity to elaborate on what I consider to be key factors in determining who the “coffee people” are. Given this vast omnipresence of coffee and the faces behind it, not one stereotype defines a “coffee person.” The range of individuals included in the Coffee People Q&A series (and those that will be featured in upcoming installments) are as diverse as the types of coffee flavorings some choose to wreck their mugs with. Some are professional roasters and baristas, others are coffee bloggers, some are musicians, others are artists. This range is what inspires one to write about coffee. As Tony pointed out in his first sentence of the interview, he is not “a very educated/informed/nuanced coffee consumer.” Indeed, coffee seems to be only tangentially related to mountain running. The correlation between the two would be a stretch for some, an ambiguity for others. But consider this. One sunny afternoon in Boulder, CO, Tony posts a photo on his social media page, a photo of a Bialetti sitting on a portable burner on the tailgate of his pickup. A pair of running shoes in the background. That single photo sparked a string of responses, almost all of which revolved around brewing coffee with a Bialetti, or portable coffee brewing in the mountains. The essence of the Coffee People series is to capture the role of coffee in people’s lives, how coffee has shaped them, and how they have shaped the realm of the coffee world. Another objective is to paint how coffee influences different cultural sectors, be it design, fashion, music, food, or mountain running. Being a professional coffee person is no prerequisite for coffee talk. To go even further, being a so-called “knowledgeable” coffee drinker is no prerequisite for coffee talk. Whether one drinks only the finest hand-poured brews, or any old steaming black cup of joe, coffee talk is coffee talk. The breadth of folks involved in this daily ritual is what makes the series. So who brews daily morning shots at 11,000 feet above sea level, in a truck? A coffee person.